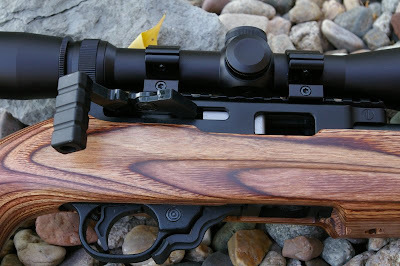 There are unique custom 10/22s out there, some are stunningly amazing, however their upper bolt/receiver assemblies operate exactly like the original 10/22 action. 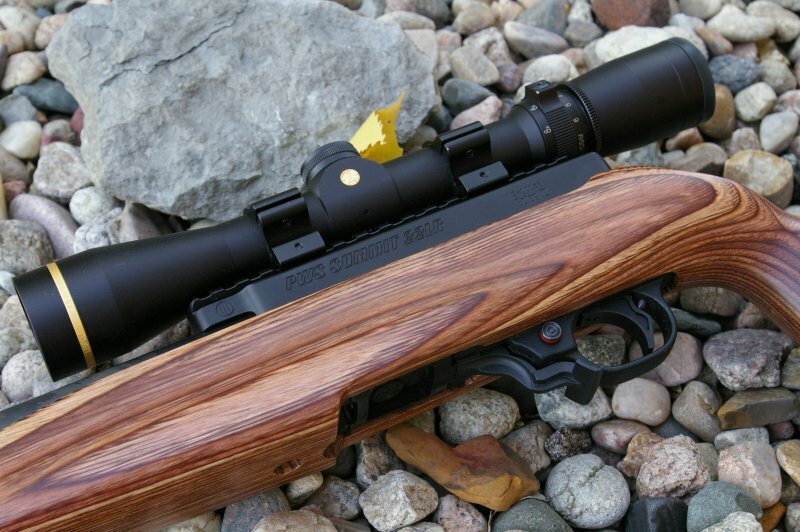 The PWS T3 Summit rifle action is unique and unlike any other 10/22 on the market. The T3 is not a semi-auto or bolt action action, but instead features an innovative biathlon upper receiver that uses the same 10/22 magazines you already own. The cammed action is based on the fast reloading and highly accurate simple straight back and straight forward action you see on .22LR olympic biathlon rifles. 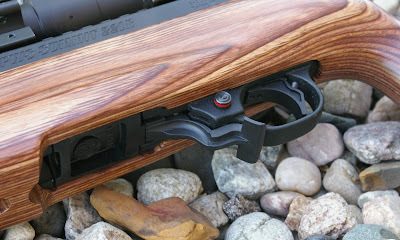 The action knob is pulled back to extract a round and pushed forward to chamber a round; in essence it is similar to a bolt action, but far faster to cycle. The cammed action locks the bolt as it is pushed forward and is so slick that you can use your index finger to operate it with most ammunition. 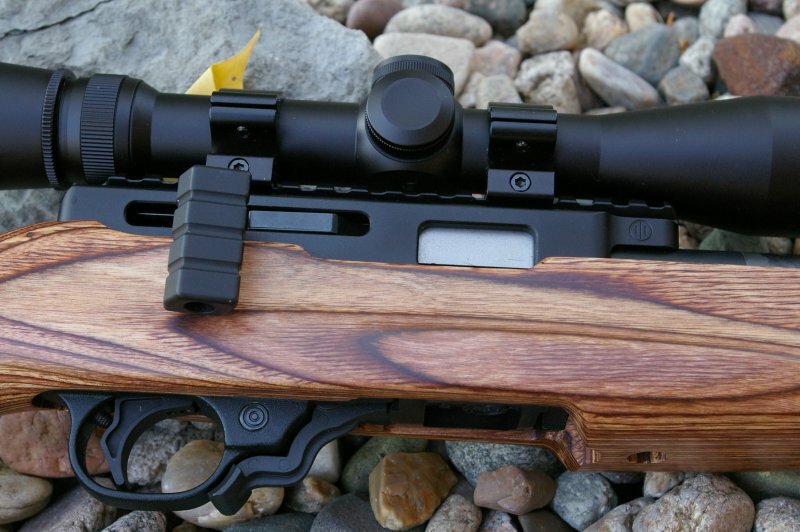 Obviously the receiver and Summit action is proprietary to PWS, however any 10/22 compatible barrel, barrel v-block, trigger group, magazine, receiver pins, or stock will work just as it would on any other 10/22 receiver. PWS made this build unique with its own proprietary laminated stock design, an excellent trigger and tensioned carbon fiber threaded barrel of their own design. 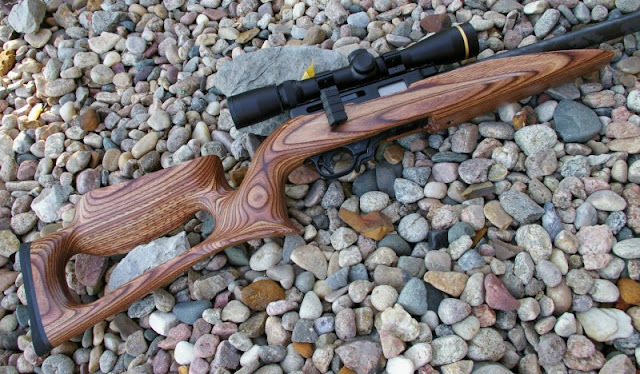 The owner of PWS (Primary Weapons Systems - an AR manufacturer) decided there should be a European legal 10/22 (they do not allow semi autos over there) which could use all the great 10/22 parts on the market and developed the T3 Summit action. 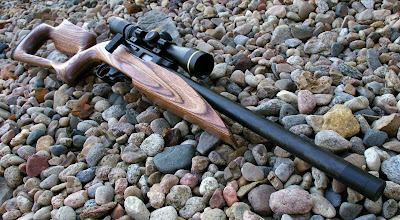 The action also has the unique ability to deliver the bolt action benefits of potentially squeaking out just a bit more accuracy and/or keep things extremely quiet in a suppressed 10/22 format rifle. Primary Weapons Systems was founded in 2005 with a focus on innovation, in fact their slogan is “Strength Through Innovation”. The company has had a meandering path from initially developing collector grade AK-47s, then AK accessories, innovative piston AR platforms, and even a 7.62x39 pistol driven AR platform. Now PWS has turned their innovation to developing the T3 Summit which is, honestly the most innovative 10/22 upgrade I have ever seen. Complete PWS T-3 Biathlon receiver with Summit action, T-3 Carbon Fiber tensioned barrel, complete trigger group, PWS Raptor Stock- - $799/95. Leupold VX-1 2-7x28mm scope - $220. Total Build $1020 as equipped. 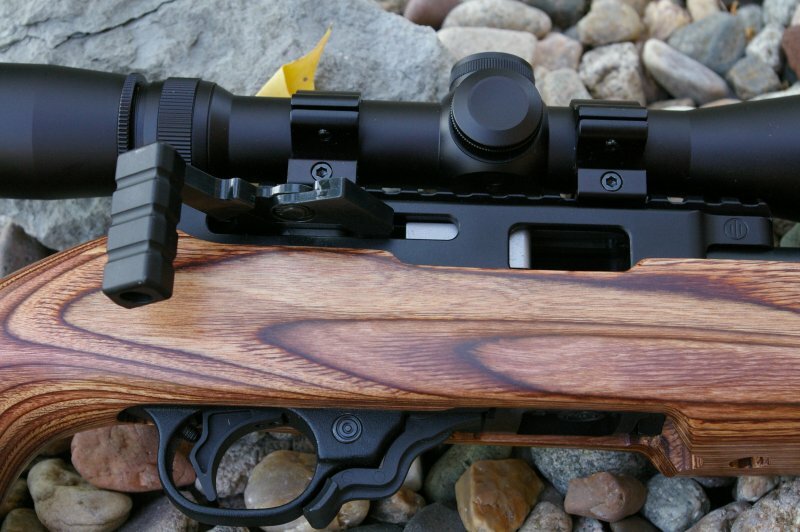 The PWS Summit action is a gorgeously designed and engineered work of art, the most sophisticated, and arguably the finest quality 10/22 action available. The engineering itself is impressive, however the real appreciation begins when cycling the silky smooth action; its like butter. The action gets all the attention, however PWS did a wonderful job on developing a crisp and light trigger assembly. There are definitely lighter match triggers, however the 1-2lb trigger pull on the PWS trigger is lighter than many other 10/22 match triggers and the flat blade reduces felt pull weight further. For the target shooter, this lighter feeling trigger pull can give definately give you an edge in accuracy. 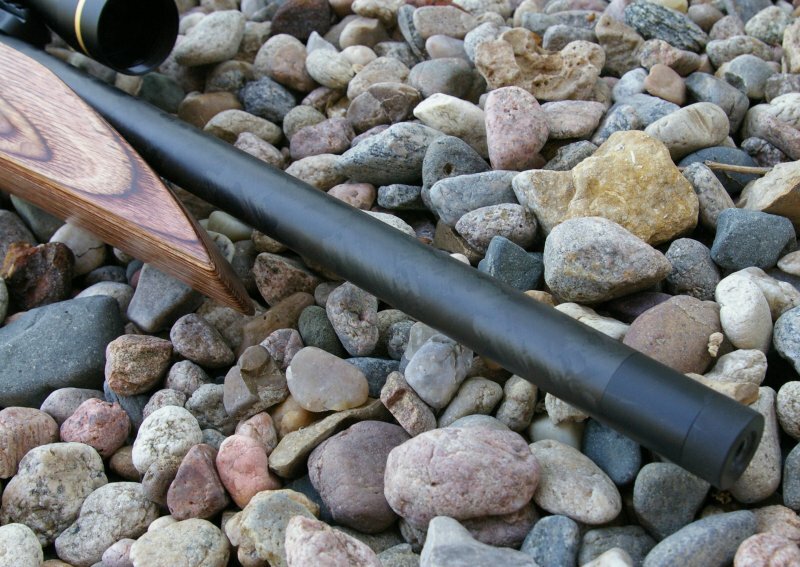 The extremely light carbon fiber sleeved barrel delivers a very easy carrying and shooting rifle for the hunter or target shooter. The carbon wrapped look is extremely cool, but is designed to greatly increase stiffness. Carbon fiber also used in high temperature applications for its heat wicking and dispersing ability - carbon wrapped barrels instantly transmit heat, so the barrel stays cooler, distorts less during sustained fire and is more accurate. Definitely a barrel that offers much more than just looks. Functionally the action fed anything that resembled a L (long) or LR (long rifle) length round including insanely quiet CCI CB Longs and the very effective Remington CBee’s. 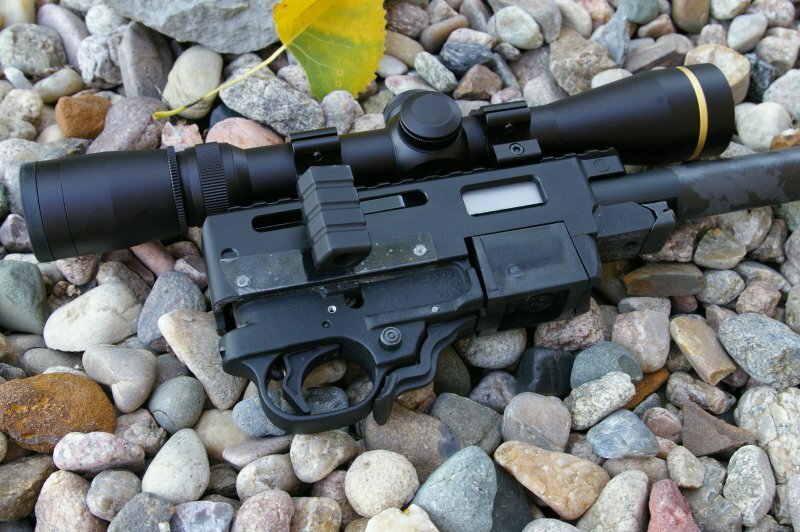 For more urban pest elimination, this is a handy gun to have that can shoot and cycle ultra-low veloicty rounds. A buddy screwed on his suppressor with these rounds and the only thing audible was the hammer dropping and with CCI standard velocity ammo it was significantly quieter than the Troy Tactical Solutions barrel build because of the added action cycling noise. 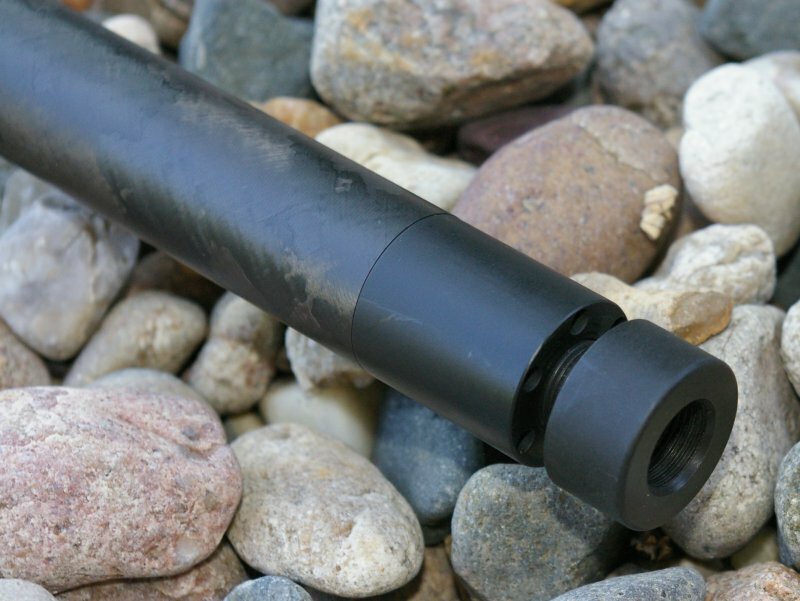 The tensioned barrel is suppressor friendly, so if you live in a free state and can swallow the $200 tax stamp plus the cost of the suppressor, you will have one really quiet rig. I was so impressed, I have now started the process to purchase a suppressor. Shooting the rifle from shot to shot is very fast and does not require that you change rifle positions or come off the scope. The T3 action is intuitive, smooth as silk, and can be cycled with just the index finger for most match ammo, however tighter rounds such as some bulk and CCI ammo does require a little extra force. There is much debate about which .22LR chamber gives you the most accuracy. Some feel that a very tight chamber will squeeze a little more accuracy out of your .22LR rounds, others seem to feel a standard Benz match chamber is good enough. PWS's Carbon Fiber barrel has a proprietary match chamber which is definitely on the tight side. Some rounds such as the CCI rounds, which are noted to typically be on the top end of SAMI spec, feels noticeably tighter going into the chamber on this barrel. With the right ammo, in this case match spec ammo, tended to both function the best and deliver the best accuracy. For me, I do not see this as a plinkers barrel, but one specifically designed around shooting high grade standard velocity (sub-sonic) .22 match ammo. PWS did a fabulous job with the modified PWS Raptor stock based loosely on the Boyds Evolution stock. When you have a field of 10/22s around you, you notice the little things and the PWS magazine release is outstandingly more ergonomic in a way that makes you want to replace all the other magazine releases on the other builds. A part that often get overlooked is the magazine release and of all the 10/22 mag release designs, this is the best I have found. The little bat wings that extend on either side of the trigger guard allow your trigger finger to just press straight down to drop a magazine; a marvelous little part. All the competing models require a grip change to some degree to drop the magazine. This is the most ergonomic magazine release I have tested. The trigger group is not a warmed over “tweaked Ruger version, it is PWS’s own proprietary trigger design. Along with the precision 6061 T6 aluminum trigger housing, the trigger, sear, and disconnector are all high precision EDM and CNC machining. The PWS trigger is mighty fine target trigger. Having the luxury to comparing this trigger directly to the Force, Kidd, and Timney trigger, I would put the PWS on the higher end of the match range alongside the Kidd. It is crisp and with just over a 1lb pull which gives it the edge on the Timney and Force triggers on the bench. I topped this rig with the VX-1 2-7 scope which has excellent clarity and is the perfect magnification range for hunting and moving targets, however I realized after the fact that this was a 100-yard parallax set scope. This build could have taken advantage of a bit more magnification and the lack of a parallax adjustment impacted precision at the 25-50 range. 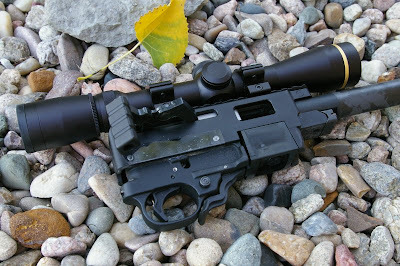 I swapped out to my other Leupold 3-9 VX2 Rimfire scope for testing. The only other complaint I had was that the PWS barrel was picky from an accuracy perspective. Accuracy ranged from a fairly stock 1.237” 50-yard group to nearly taking the best group title from the Kidd build with a .247” group at 50 yards in initial testing. It is a spectacular barrel when you find the right ammo, however it can be a bit frustrating to see stock level groups printed from a $1000 during that process of ammo discovery. When you do find the right ammo, you will be rewarded with stunning groups. Generally the Summit has shown to favor standard velocity rounds over high velocity rounds. The carbon fiber barrel looked the coolest, however the accuracy variability really drove me nuts. Hopefully this variability will decrease as the rifle breaks in and I can continue testing various rounds. 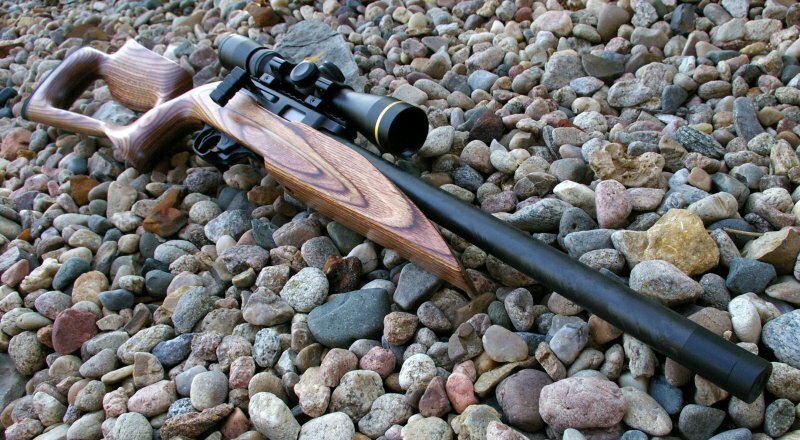 Based on my initial recorded accuracy and additional informal shooting since then, the pattern which has emerged is a preference for .22LR ammo on the lower width range of SAMI specifications, which means it has a very tightly spec'ed match chamber. The frustration for me is that I have seen reports of these PWS T-3 barrels performing well across the board with a variety of ammo and even out-shooting Kidd barrels, however this barrel was picky about what ammo would deliver on accuracy expectations. As they say, "your mileage may vary" with this barrel. Upcoming Part II - I will best using the awesome receiver for a few barrel tests. The unique locking bolt mechanism technically should deliver the most accurate 10/22 ever, so I am very excited to get this project underway. During initial testing PWS always seemed to create wind gusts. Pull the gun out and the wind picks up, start shooting something else and the wind died down... almost comical at one point. In the end the PWS shooting accuracy results have some gaps and I wish I could have spent more time side by side in the same conditions shooting this against the others before this article, however testing 6-8 rounds at a time takes the better part of a day for five rifles. I have shot the rifle a lot since those initial groups were recorded and so far I have not seen any substantial changes which would influence my initial observations other than my enduring love for the Summit T-3 biathlon action. The barrel I have a love and hate relationship with. On one had it the most incredible looking barrel I have ever seen and when it finds the right ammo, it delivers stunningly little groups. On the other end, the barrel drove me a bit crazy with accuracy with ammo it did not like. 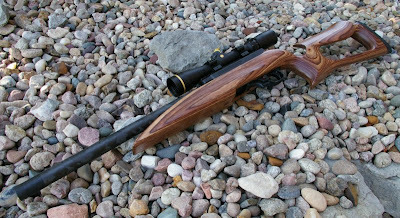 Look for this action to reappear in a build as I test it out with a host of other 10/22 barrels. I believe this locking bolt biathlon action could deliver the best accuracy yet from some of my previously tested barrels. If you want to build your own, the Summit T-3 receiver action is available separately for $399 or complete with the PWS trigger assembly for $525. The Summit action is cool for us here in the US where semi-auto actions are legal, however PWS deserves commendation for developing a European legal action that can leverage all the great and wonderful 10/22 accessories on the market. This is truly the most unique and innovative 10/22 on the market today and potentially the most accurate as well. Did you ever end up playing with different barrels to see if ammo was less picky (and sticky) with different barrels? I am considering ordering just action and getting my own barrel and stock. Would love to hear from you. Every barrel is unique, and every batch of ammunition is unique. That's why Eley has several Customer Ranges, where you go to lot test ammunition in your barrel!